Most of the bad circumstances in my life are directly attributable to the magical machinations of an evil conspiring gnome. The evil gnome is constantly working mischief in my life. When I’m not looking, he forwards the time on my watch. He un-ties my shoes and hides my possessions. The evil gnome even convinces people to not accept my Facebook friend requests. Subtract the rosy red checks and the cute cone hat. Add red coloring to the eyes, a few inches to the teeth and a nose ring. Keep the darling blue outfit. 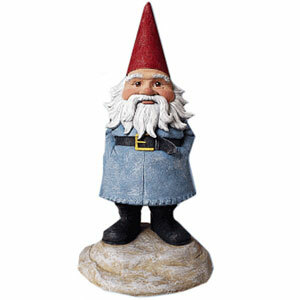 The evil gnome bears a striking resemblance to the infamous Travelocity Gnome. The other day I had a near mental-emotional breakdown at school. I had lost my laptop’s power chord. I distinctly remembered placing the power chord in my backpack, just before leaving the house. I put it there. In my backpack. Just before leaving. But the power chord was gone when I reached into my backpack to grab it during class. I couldn’t figure which hurt worse: the practical consequences of losing my computer power chord or the emotional consequences brought by the realization that all my plans for the evening, and the weekend, involved my computer power chord. So after I got out of class, I searched. I searched and searched. I searched everywhere I had been that morning. Like someone for a long lost lover, I searched. I interviewed people: professors, students, janitors. Not even a clue. I ran through the possibilities in my mind. But my mind could not yield anything even vaguely similar to a rational explanation. Did the power chord fall out of a hole in my backpack? No, that couldn’t be. I checked the backpack for holes. Was my backpack a teleportation portal? No, that couldn’t be. Portkeys were things strictly found in Harry Potter books, which were things strictly found in the fiction section at bookstores. Had I neglected to call out ‘SWIPER NO SWIPING!’ when a sly bandana’d fox had approached? No, that couldn’t be. I hadn’t seen any foxes that morning. Then it hit me: the evil gnome had taken my power chord. Like so many times before, the evil gnome had made me a victim of circumstance. I felt completely lost in my next class without a power chord, without a functioning laptop. I tried several times in vain to update my Facebook and Twitter feeds telepathically. I also tried playing minesweeper in my head. No use. It was impossible to remember where all the mines were. There was always the option of paying attention to my professor. I could take notes with archaic things called ‘pens’ and ‘papers’ which, when used together, act as a primitive word processor. The problem was that I could not read the font type which appeared on the paper after the pen was applied. And I could not figure out how to change the font type to make it legible. I ultimately decided to stare at the inside of my eyelids which I found infinitely more interesting than the lecture—especially while asleep. But I awoke to despair. My power chord was gone. The evil gnome had taken it. Later, when I had gotten home from classes, I discovered the power chord. It was in my room. Lying on the floor. Plugged into the wall. Exactly where I’d seen it last. Unbelievable. How could I have been so naive? The evil gnome knew that would be the last place I’d ever look: where I’d seen it last. At school before my first class, the evil gnome had stolen the chord from my backpack, flown all the way to my house in his evil-gnome-glider and surreptitiously placed the chord exactly where it was the night before.